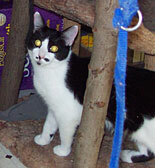 Bandit got her name from the "mask" around her eyes & the old-time-villian-like "mustache & goatee". "Zorro" would have been the perfect name but didn't quite suit this young lady. Bandit came to CR!FR a bit ahead of her sisters Flash, Zephyr & Phantom, brother Samson & mom Sheba last year. They are a beautiful & striking family but are all quite shy. 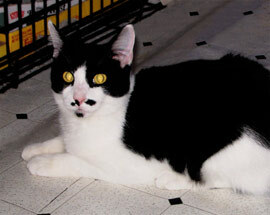 Bandit, though, is the most out-going, curious & sociable. She's comfortable around people & but isn't ready for a touchy feely relationship; she prefers to be admired from a distance. Even though she's shy, Bandit spends a lot of time upstairs on the porch & bunk beds. She often stretches out on the floor, rolls over on her back, & gives you a look as if to say "hey, pet me... psych!". She also likes to play with strings & toys. Bandit has the potential to be a super companion for the right person. With enough exclusive attention & patience she's likely to overcome her apprehension & trust people. She's already halfway there.